In this blog, I have both good news and bad news for you. The good news is that a new study from biologists with the Florida Fish and Wildlife Conservation Commission and the U.S. Geological Survey used data collected during aerial surveys in 2015 and 2016, combined with statistical estimation methods, to come up with a new estimate for the state’s manatee population. This study found that the Florida manatee population “is now between 7,520 and 10,280.” This is excellent news and a wonderful increase, especially when you compare it to the 2011/2012 population data of 5,680 – 8,110 Florida manatees. Red Tide can be an unusually persistent and harmful algal bloom. It is currently still affecting parts of the west coast of Florida. Red tide is caused by Karenia brevis algae and it produces toxins that can kill fish, manatees, sea turtles, birds and dolphins. In 2018 there was even a giant whale shark that died from Red Tide. 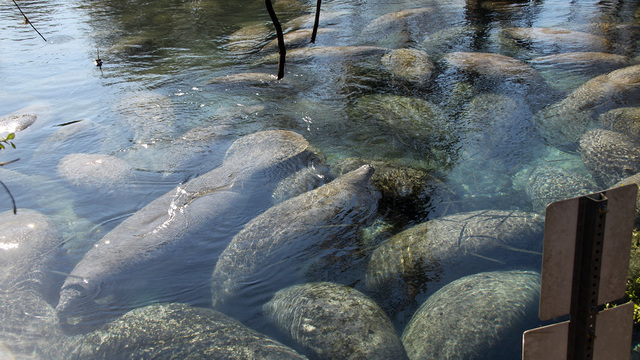 Cautious News for the Possible Increase in Florida Manatee Population?